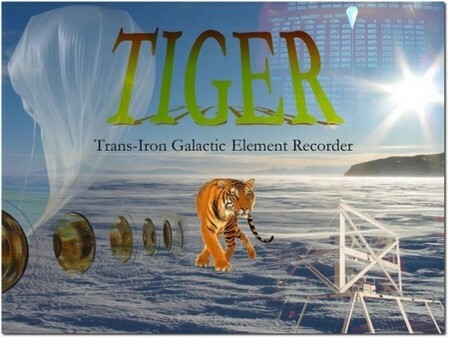 TIGER (Trans-Iron Galactic Element Recorder) is a balloon-borne NASA instrument that had three successful flights: one from Fort Sumner, NM (summer of 1997), and two from Antarctica (December 2001 - January 2002 and December 2003 - January 2004). The TIGER instrument measures the elemental composition of cosmic rays heavier than iron. TIGER is a collaboration between Washington University in St. Louis, NASA Goddard Space Flight Center (GSFC), the California Institute of Technology (Caltech), and the University of Minnesota. After the 2001-2002 flight, the instrument journeyed back to the U.S. from Antarctica and was completely disassembled. Then the science team and technicians reassembled it with some improvements. TIGER then made its long, cold journey back to the Ross Ice Shelf (McMurdo Base) for this flight. 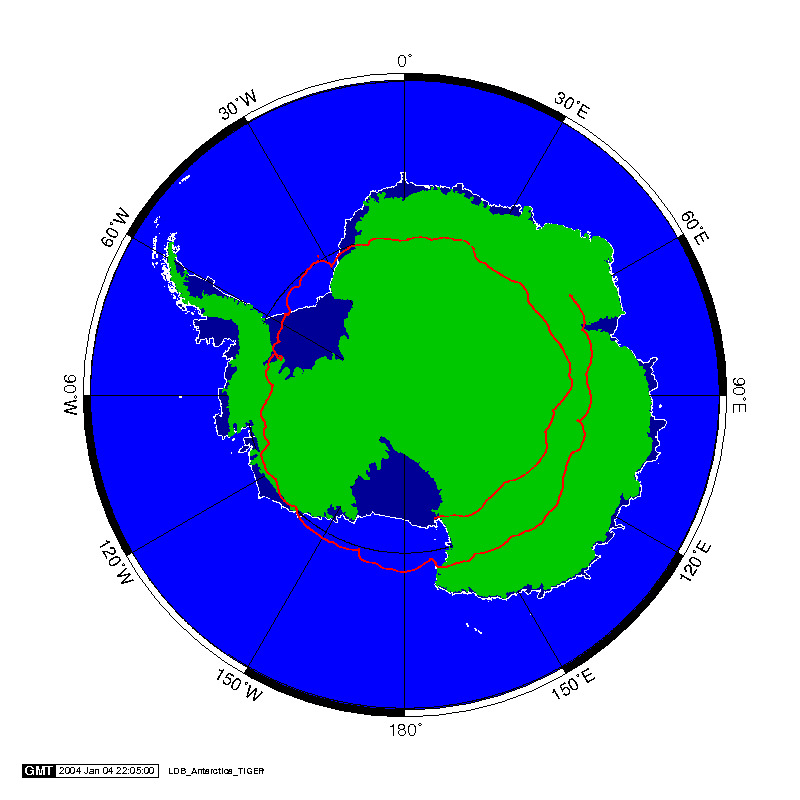 The TIGER balloon launched from Mc Murdo base in Antarctica on December 16, 2003 at 23:05 EST (December 17 at 17:05 McMurdo time and 04:05 UT) and began its second loop around the continent on December 30. The average altitude for this flight was approximately 128,000 feet. After an 18 day flight, on January 4 the instrument was successfully brought down near the Australian Mawson Antarctic base. 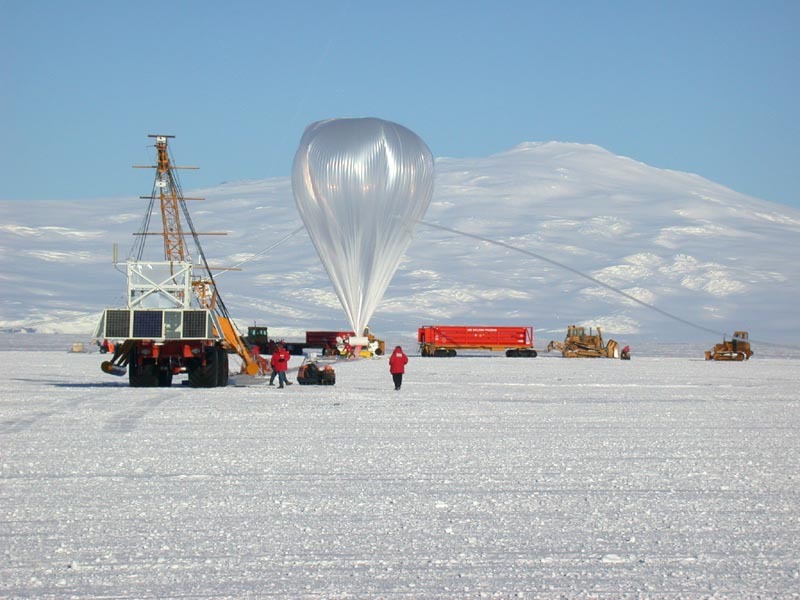 The ANITA team flew a small prototype instrument, ANITA-LITE, to understand more about the radio background in Antarctica and begin a search for the highest energy neutrinos known. The goal of the ANITA experiment was to listen for sharp bursts of radio waves emitted when a high-energy cosmic-ray neutrino interacts within the ice. Project Aria is Washington University's K-12 outreach program aimed at inspiring students in science and technology through hands-on participation in actual space projects. Aria-9 was the TIGER K-12 Experiment Package, a portion of which was a replacement for the same experiment lost in the Space Shuttle Columbia accident. TIGER was the first instrument to attempt two circuits around the south pole with a flight time of 20 - 30 days. The last TIGER flight landed at about 9 p.m. on Jan 21, 2002 (McMurdo time in Antarctica), 31 days 21.5 hours after launch. This set an endurance record for a long-duration balloon flight. During the flight, TIGER collected 31 days, 13.5 hours of good data at float (> 110,000 feet in altitude). Read more this flight on the Imagine the Universe! News. A science talk was given on the results of the 2001-2002 flight at the 28th International Cosmic Ray Conference (ICRC) in Tsukuba, Japan in September 2003. Jason Link presented the TIGER paper for the team. During both Antarctic campaigns, Dr. Eric Christian (TIGER scientist from NASA Goddard Space Flight Center) worked with high school students back in the U.S., answering their questions about the Antarctic and the TIGER mission, and doing shadow measurements for one of their projects. He also kept a journal with many pictures, and researched some topics of special interest. Eric and Lauren Scott of Washington University continued these projects through the 2003 campaign. Their journals are online.